CNN’s POLITICAL GUT CHECK | for June 6, 2014 | 5 p.m. Gut Check DVR: Tune into CNN’s Jake Tapper’s special half hour documentary on Bowe Bergdahl tonight at 10pm ET. MARKET WATCH: Solid week for stocks ends with Dow, S&P 500 at record highs. NASDAQ finishes at highest level in nearly 3 months. What was the code name for the Allied invasion of Normandy 70 years ago? Leading CNNPolitics: 'Hard Choices': A book rollout or a campaign tune up? Leading CNNMoney: Apple to be 'cheap' Monday. Will you buy? Brooklyn had something like 4,000 hotel rooms as of 2013. 35,000 people attended the Charlotte convention. This'll be fun. SEN. TOM HARKIN, D-IOWA, TO THE DES MOINES REGISTER: “I think Hillary would be the first to say no one ever has something all locked up. This is not a coronation or anything like that ... And you never know. Sometimes a dark horse can come up the inside track on this and surprise people. You never know." Gut Check DVR: Watch Inside Politics at 8:30am E.T. Sunday with CNN’s John King and guests Steve Inskeep, Maeve Reston, Jackie Kucinich, and Laura Meckler. And catch State of the Union at 9:00am E.T. Sunday with CNN’s Candy Crowley for an exclusive interview with Secretary of State John Kerry and guests Sen. John McCain, R-Arizona, Maj. Gen. Paul Eaton, Lt. Gen. Jerry Boykin, Gen. James Mattis, Donna Brazile, Jackie Calmes, and Ana Navaro. Wow, if Club For Growth is going after Travis Childers in Miss., before GOP runoff, do they think he has a chance against @CMForUSSenate? The Secret Service is onto your sarcasm. RT @CIA: We can neither confirm nor deny that this is our first tweet. The Normandy invasion that took place 70 years ago today was known by the code name "Operation Overlord." There was no guarantee of success for the massive, unprecedented undertaking as Allied troops crossed the English Channel with the goal of smashing Hitler’s Atlantic Wall and liberating Europe from Nazi tyranny. Today, President Obama honored the sacrifice of those troops at ceremonies in France. The president stopped to shake hands and thank some of the 1,000 D-Day veterans present for the occasion. Congrats to Ricardo A. Perez (@elaggie) and Steve Liguori (@SteveL3877) for correctly answering today’s Gut Check trivia question. –this president is smart and timely. "…AS WHITE HOUSE CONTINUES BERGDAHL DEAL DEFENSE ... "
"AS GOP/TEATROLLS CONTINUE THEIR RABID BERGDAHL ATTACKS...."
Heck, Faux even had one of their ignorant bobbleheads today literally endorse the idea of Bergdahl's platoon murdering him and sending him home in a body bag if they had found him. But no, CNN has to try to spin it back on the administration. We get it, CNN....AFP has deep pockets. Vote the dem drug pushers out ! Vote the dems 0ut they gave guns to the drug cartels that support terror groups ! save 0ur kids ! "CNN’S JIM ACOSTA ASKS WHITE HOUSE NATIONAL SECURITY ADVISOR SUSAN RICE: By meeting with Vladimir Putin, is Obama “letting the Russian president off the hook here?”"
You'd never have asked something in that manner of Dubya. And you know what? How freekin stupid is that question anyway in light of all the work that's been put into getting a coalition of nation's together and the crippling sanctions that have been levied against Russia, which has a horrifyingly bad economy to start with and whose people are going to suffer for this? Hmmm? 10-15 minute polite conversations with adversaries somehow undo all of that when the substance of the conversation was essentially "you need to cut the crap, Pooty"? Do you guys even listen to yourselves? It's freekin childish what you do, constantly trying to manufacture something to sensationalize. You're like 12 year old middle school girls gossiping. Grow up. "Obama administration officials held a closed-door, classified briefing on Wednesday in which they spent more than two hours detailing to senators the trade of five senior Taliban leaders for U.S. Army Sgt. Bowe Bergdahl, but many lawmakers decided to leave early"
BTW, you'd never have asked something in that manner of Dubya. And you know what? How freekin stupid is that Jim Acosta question anyway in light of all the work that's been put into getting a coalition of nation's together and the crippling sanctions that have been levied against Russia, which has a horrifyingly bad economy to start with and whose people are going to suffer for this? Hmmm? Is he your new Ed Henry? 10-15 minute polite conversations with adversaries somehow magically undo international teamwork and sanctions even though the substance of the conversation was essentially "you need to cut the crap, Pooty"? Do you guys even listen to yourselves? It's freekin childish what you do, constantly trying to manufacture something to sensationalize, feeding the GOP/Teatrolls while you feed off them. You're like 12 year old middle school girls gossiping...but while on bath salts. Grow up. @Rudy-First, all the anti-assad fighters are fighting jihad. Second, 1 of 2 common links is all these fighters are Sunni radicals. Third, 2 0f 2 common links is that they are all against Assad. Which is exactly what I said. Your lame attempt to justify giving aid to Sunni radicals is fodder. Ahhhh, Fast and Furious was a BUSH program which Obama and the DOJ only continued. Probably because they had no choice due to W committing them already. It would be fun to see them both play hockey or Basketball together instead of acting stupid . Go LA ! Go Spurs ! s0 they the anti gun .gave guns 4 drugs dems will do any thing to mess up normal . thx. Sounds like that came out of a fortune cookie , I like it ! WOW, Really??? Pretty strong words from our President!! To bad he doesn't have the back bone to back up those words. Wait, maybe Putin would take a few of the Taliban from us in trade for Ukraine??? Naw! 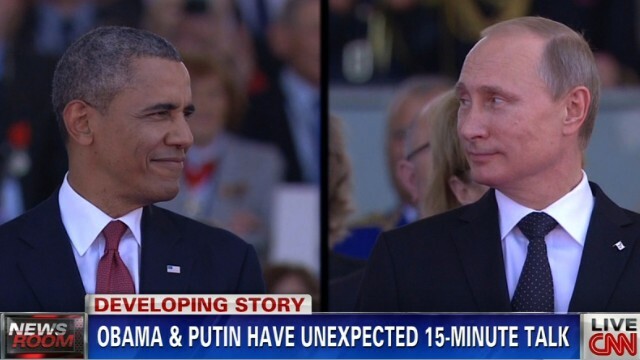 I wonder if Putin's jaws still hurt this morning from laughing so hard at Obama trying to act tough in front of a crowd. What a punk. All show and no go Obama. The world is getting tired of his empty words as much as we are here in the USA.